High medicinal value. Couch-lock with pain relieving effect. Dr Feelgood Auto Seeds Review. Many of Short Stuff Seeds customers have commented on the excellent medical properties of Blue Himalaya and Himalaya Blue diesel, so they thought they would try and produce a new strain that offered even better medicinal benefits. 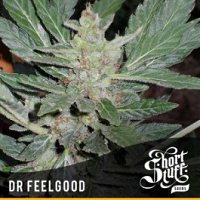 Dr.Feelgood is a pure medical strain, great for pain relief and a true autoflowering Indica. It was created by crossing the Short Stuff Auto line with an old skool Afghan Kush which was renowned for its fat buds, smooth smoke and high levels of CBD. These qualities have been carried through to Dr Feelgood making it the best medical Autoflowering strain to date!